Do you really need new siding, or do you just need brighter siding? If you’re counting your pennies this year, a new siding project can feel like a lot to swallow—particularly if your update is purely aesthetic. Often, siding that’s perfectly functional gets tossed due to its outward appearance. Take, for instance, aluminum siding. Rot-resistant, durable, and corrosion-proof, it’s one of the most steadfast siding materials around. Unfortunately, while aluminum itself can stand up to virtually any extreme condition the elements can cook up, the anodized paint on its surface often wears away after a few decades outside. For many homeowners, it can feel like a waste to rip off perfectly serviceable siding just because it’s seen a little wear. But living with drab or rundown cladding is no fun, either. Vinyl also fades over time, particularly when it’s regularly exposed to intense sunlight. While most siding warranties guard you against some level of fading, the level of protection differs vastly from company to company. So there’s not necessarily a guarantee that fading will be covered—even if the siding itself is still quite serviceable. Luckily, there are ways to brighten up siding that’s seen better days—for a fairly affordable price, too. Cleaning and even painting siding are all possible options, and they cost a lot less than a full residing project. Sometimes all your siding needs is a little TLC. Vinyl siding in particular can become stained over time from the effects of moisture and mildew, dust, pollen, and rust. However, you can DIY a homemade cleaning solution that is fairly effective at cleaning away these common blemishes. Just mix together seven parts water to three parts vinegar—or a quart of bleach, a gallon of water, and a third of a cup of laundry detergent if you need something stronger. 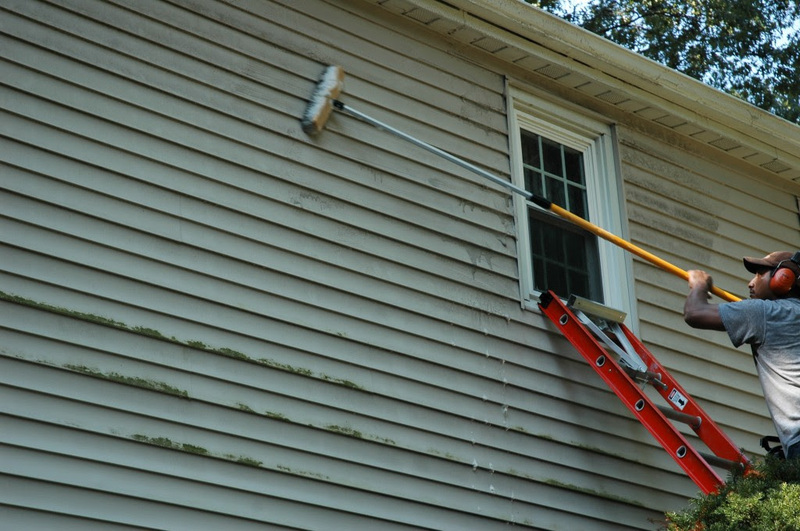 Fill a spray bottle with the mixture and work from the top down, scrubbing the siding with a soft-bristled brush. Whatever you do, don’t use a pressure washer, since many siding manufacturers advise against this cleaning method. 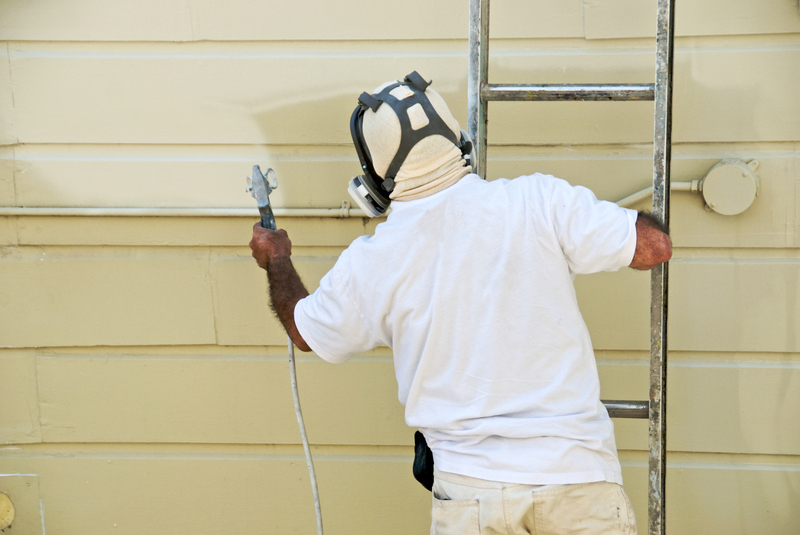 Spray it down with a hose when you’re done, and take a few minutes to appreciate your newly-sparkling siding! What about commercial siding cleaners? Restoration products do exist, but they’re not typically recommended. Typically, the cleaners used by professionals are fairly expensive (think: $400 for a 5-gallon bottle)—and the rest may not work at all. So if you do decide to try out one of these products, you should know that they may not get you the results you’re hoping for. Some experts have been known to use car-cleaning products like Armorall or Penetrol to bring shine and luster to aged siding. If you want to try it, just follow the instructions on the bottle—but be aware, this is not a commonly used method, so you may be taking a risk if you do so. Truly stubborn grit and grime may call for a more serious cleaning. That’s when it’s time to tap the know-how of a professional. A pressure washing company can help you get rid of heavy stains and dirt. House cleaners know their way around a pressure washer and typically use low-grade pressure and safe cleaners to keep siding safe from damage. Of course, professional work always comes at a premium. Budget around $275 to $400 for house cleaning services, depending on the size of your home and the average costs in your area. That’s still much cheaper than residing your home! Cleaning won’t do you much good if your siding is really faded. In these cases, painting is usually your best option. But don’t worry: all that cleaning wasn’t for nothing. If you’re going to repaint, you need to make sure you completely remove grime, dust, pollen, bird droppings, and tree sap before you begin. While you’re cleaning, keep an eye out for damaged or dented pieces that you might want to replace before you repaint. Repairing small sections of vinyl siding is a manageable job that a lot of homeowners choose to DIY. You follow a similar process for aluminum siding repairs, using a siding patch adhered with silicone caulk. Also be on the lookout for chalky residue. This can appear on the side of homes when aluminum siding finishes are breaking down, and you’ll need to use a special product to cover it to ensure that the paint properly adheres to the siding. You’ll need to add EmulsaBond to exterior latex paint, which effectively makes your topcoat act as both a primer and a paint. To paint vinyl siding, on the other hand, your best bet is to go with a specially-formulated product, like Siding in a Can, that’s meant to be used specifically to this end. Never paint vinyl siding in a darker hue than the original color—this can cause the siding to melt and warp when it interacts with the sun. Everything looks fresher and brighter under a new coat of paint, so repainting is definitely worth the effort. And when your neighbors complement you on your new siding, it’ll be your little secret.